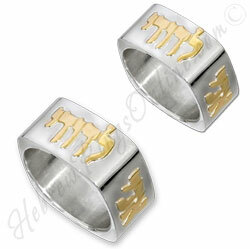 Beautiful hand crafted square Silver ring set with 14K Gold letters. According to the Kabbalah the Square ring brings Good Luck and success in life. When you buy one of our " His & Hers " couples' ring set, you get an extra discount on our low everyday prices. "I am to my beloved and my beloved is mine" (In Hebrew: Ani Ledodi Vedodi Li) אני לדודי ודודי לי"This is my beloved and this is my friend " (In Hebrew:Ze Dodi Veze Re'ei ) זה דודי וזה רעי"Love is the source of life" (In Hebrew:Ha'ahava Hi Mekor Hachaim) האהבה היא מקור החיים"I found him, whom my soul loves" (In Hebrew: Matzati Et She'ahava Nafshi) מצאתי את שאהבה נפשי"Wherever you will go, I shall follow " (In Hebrew: Ba'asher Telchi Elech ) באשר תלכי אלך - באשערט"I Have Loved You with an Ever Lasting Love" (In Hebrew: Ahavat Olam Ahavtich ) אהבת עולם אהבתיך"Put Me Like a SEAL Over Your Heart" (In Hebrew: Simeni Kahotam Al Libcha ) שימני כחותם על לבך"Let Our Souls and Spirits Interwine" (In Hebrew: Tihye Nafshi Kshura Benafshech) תהייה נפשי קשורה בנפשך"When I went forth to find you I've found you seeking me" (In Hebrew: Betseti Likratcha Likrati Metsaticha) בצאתי לקראתך לקראתי מצאתיך"This too shall pass" (In Hebrew: Gam Ze Yaavor) גם זה יעבור"Trust in the Lord with all your heart" (In Hebrew: Betach Bahashem Bechol Levavcha) בטח ב-ה' בכל לבבך"As for me and my house, we will serve the Lord" (In Hebrew: Ani Uveyti Naavod Et Hashem) אני וביתי נעבוד את השם"The Lord bless you and keep you" ( In Hebrew: Yevarechecha Hashem Veyshmerecha) יברך ה' וישמרך"The lord is my shepherd i shall not want" ( In Hebrew: Hashem Roi Lo Echsar) ה' רועי לא אחסר"The Lord is my light and my salvation" (In Hebrew: Hashem Ori Veyishi) ה' אורי וישעי"For i know the plans i have for you" ( In Hebrew: Ki Yada'ti Machshavotai Aleychem) ידעתי מחשבותי עליכם"I want to use text of my own"